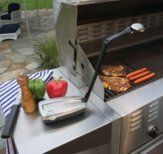 LED BBQ Light [LED BBQ Light] - $34.95 : NewDaVincis.com!, Great Innovative Products, Gadgets and more. Barbecue In The Dark With This Rugged, Safe, Battery-Operated, High-Intensity, LED Light! Introducing the LED BBQ Light. Heat-resistant, stainless steel construction provides durability and style. The ultra-bright LED's provide exceptional light for grilling, camping, picnicking and more. LED's are energy efficient, cool to the touch, and last a lifetime (100,000 hours). The LED BBQ Light incorporates a fully-articulating arm and head for flexible use. It extends an amazing 19", and folds compactly for easy storage and portability. This wireless, weather resistant light is perfect for indoor and outdoor use. Requires: Four "D" batteries (not included) have a burn time of over 25 continuous hours.